This fluted bowl has many shades of green, both inside and out. Notice the intricate patterns on the outside and the added swirls of teal on the inside. 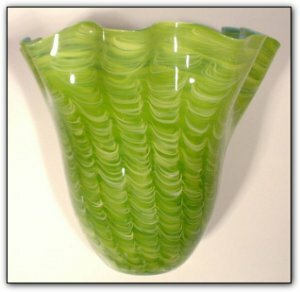 This is a uniquely taller fluted bowl with the height and width being almost equal, and is a stunningly beautiful and elegant piece of glass.